Breakfast and weight loss: Is it really the most important meal of the day? Twitter line: Scientists are in the tank for Big Breakfast. Does it really help you lose weight? Could eating this really be better for your health than skipping it? I eat breakfast every morning—usually a bowl of Grape-Nuts with fruit, pecans, and a splash of goat’s-milk yogurt. See how virtuous I am? My dietary habits have been endorsed by the nation’s leading gurus of good health: The Mayo Clinic says that morning meals reduce hunger and stave off obesity; so do Dr. Oz and WebMD, and the editorial page of the New York Times. According to the surgeon general, having a sensible meal to start your day “may be important in achieving and maintaining a healthy weight.” Cheerleading for Cheerios has even made its way into the nation’s highest kitchen—in the Obama household, skipping breakfast is not allowed. The pro-breakfast lobby has only gotten stronger in the past few months. In June researchers at the University of Minnesota published an analysis of 18 years of survey data from 3,600 young adults and showed that people who had breakfast every day gained 4 pounds fewer, on average, than habitual breakfast-skippers. The eaters were also at lower risk for obesity, hypertension, and diabetes. In March another team found similar results among Malaysian adolescents, adding to a long list of cross-cultural confirmations that breakfast is, in fact, the most important meal of the day. The same effect has been studied in Asia and in Europe, in children and in grown-ups, and the answer always seems to be the same: The more regularly you eat breakfast, the slimmer you’ll be. The mere fact of this association doesn’t tell us very much about what breakfast really does, of course, and it’s possible that the case for eggs and toast has been overblown. A study published last week in the American Journal of Clinical Nutrition starts with this simple fact—that in spite of all these association studies, no one knows exactly what skipping breakfast might be doing to our bodies. The study goes on to make a disturbing claim: Scholars in this field of inquiry—breakfast science—have been fudging facts and misinterpreting the science. The literature shows signs of research bias. That doesn’t mean any of the studies described above is fraudulent or dubious. There certainly is a link between skipping meals and getting fat, but Andrew Brown, a nutritionist at the University of Alabama at Birmingham and lead author of the new critique, points out that large surveys of people’s diets and their health are at most suggestive. Lining up several dozen of them in a row doesn’t add much more value to their claims. It could be that my yuppie morning ritual really keeps my BMI in check, perhaps by changing my metabolism or helping to control my appetite. But it’s also possible that my breakfast habits do nothing for me on their own, and that they only correspond to some deeper determinants of health. As a breakfast-eater, for example, I’m more likely to work out than other people. At least that was the finding of a breakfast study from 2008, which also found that breakfasters tend to be rich and white, and less likely to indulge in cigarettes and alcohol. Any of these factors might protect someone from obesity and diabetes, so it’s hard to know what role might be left to eating breakfast. 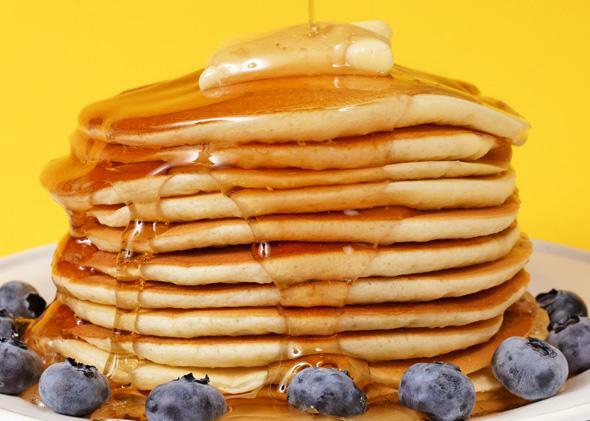 There are other confounds, too: People with lousy sleeping schedules may have less time for making pancakes. So what makes them fat—missing breakfast or not getting a good night’s rest? Here’s another: People who are trying to lose weight often make a point of missing meals. The fact that they’re on a diet, though, suggests that they’ve been gaining pounds, not shedding them. Does skipping breakfast make them fat, or do people who are getting fat choose to skip breakfast? According to the paper, the p-value for all this breakfast research put together had dropped below .001 by 1998. That means that given all the studies that had been done by that point, there was just a one-in-1,000 chance that the finding was due to chance—and that breakfast habits are unrelated to body weight. (In general scientists see fit to publish findings if the p-value is less than .05, or one-in-20.) Despite the high degree of certainty, the breakfast scholars kept up their work and published more data on the same question: Does skipping breakfast make you fat? By 2003 this research had zeroed in on the effect of breakfast with such precision that the p-value dropped to .000000000000001. Even so, more studies were done, and then some more again, until the cumulative p-value for this effect sank to less than 10-42. The chances that this was just a random data blip were down to one in 1 tredecillion. That might make it sound like skipping breakfast causes obesity, and that the government should start passing out free cereal in low-income neighborhoods. But all it really means is that the two are very surely associated in some specific way. For many years scientists have known this to be the case beyond a shadow of a shade of an umbra of a doubt. Yet they’ve continued to replicate the finding instead of doing follow-up work—in the form of randomized, controlled trials—that might extend our knowledge further. What accounts for this redundancy? It’s mostly to do with cost, says Mark Pereira, a University of Minnesota researcher who published the most recent association study on breakfast and obesity in June. At this point such research may not advance the state of knowledge very far, but it’s cheap to do. By drawing on an existing data set—the Framingham Heart Study, for example, or CARDIA—a scholar can finish an analysis for a few thousand dollars. Pereira would like to follow up his work with a randomized experiment in which subjects are assigned to breakfast and no-breakfast groups, then followed for two months. That would give a better sense of whether breakfast really prevents weight gain, but Pereira would need a $2 million or $3 million grant to make it happen and several years of research time. Meanwhile, the National Institutes of Health may be unwilling to invest that much money when the value of a healthy breakfast has already been established as a principle of common sense. We’ve had so many association studies now, completed in different contexts but arriving at the same results, that funding agencies may assume the question has already been decided. The redundant work could hurt breakfast science in other ways as well. Every time a research group suggests that eating breakfast might prevent weight gain, more health-conscious people make a point of doing so. This could exacerbate the confounds that we knew about already: Now the healthiest, thinnest people in the population will be even less likely to skip their morning meals than they were before—and the putative “effect” of eating breakfast will seem to grow in size. The pro-breakfast bias seemed even more egregious when Brown et al. looked at how these papers cite existing literature. In referring to a randomized trial from 1992—one of very few such experiments on the relationship between eating breakfast and gaining weight—more than half exaggerated its findings to make breakfast sound important. According to that study, people who normally skip breakfast did lose more weight when they were told to change their morning routine. But the opposite was true for habitual breakfast-eaters, who lost more weight when they stopped eating breakfast. Still, it might not be such a good idea to wait around for better evidence. Advising people to eat breakfast may not really help to keep you thin, but there isn’t any evidence that it makes you fat. It’s also possible (but by no means certain) that breakfast improves cognitive abilities and mood in kids and teenagers. So what’s the harm in trying, just in case it works?